Orpheus (Greek: Ὀρφεύς) wis a legendar muisicker, poet, an prophet in auncient Greek releegion an meeth. The major stories aboot him are centred on his ability tae charm aw livin things an even stanes wi his muisic, his attempt tae retrieve his wife, Eurydice, frae the unnerwarld, an his daith at the haunds o thae wha could nae hear his divine muisic. 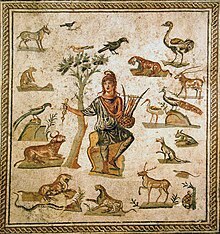 As an aircheteep o the inspired sangster, Orpheus is ane o the maist signeeficant figurs in the reception o clessical meethologie in Wastren cultur, portrayed or alludit tae in coontless forms o airt an popular cultur includin poetry, film, opera, muisic, an pentin. ↑ Geoffrey Miles, Classical Mythology in English Literature: A Critical Anthology (Routledge, 1999), p. 54ff.